Two eggs, homefries, toast & jelly. 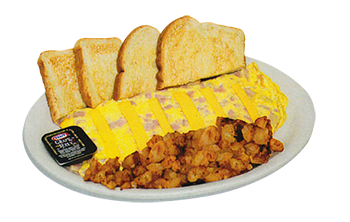 Two eggs, homefries, and choice of ham, bacon or sausage with toast & jelly. Two eggs and two pancakes or two slices of French toast. With ham, bacon or sausage. Two Eggs, Toast & Jelly. Two pancakes or three slices French toast with ham, bacon or sausage. Three pancakes or four slices of French toast. Buttermilk cakes hot off the griddle. 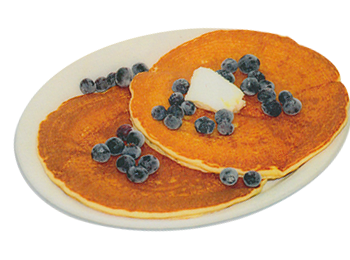 Your Choice of Chocolate Chips, Banana, Blueberry, Strawberry or Cinnamon. Served with toast, jelly, & homefries. 8oz. choice cut New York strip served with toast, jelly & homefries. 8oz. hand•carved ham steak, two eggs, homefries, toast & jelly. Two lean pieces of Canadian bacon, two eggs, homefries, toast & jelly. Two eggs, scrambled with cheese and topped with your choice of bacon, sausage, or ham atop an English muffin. Served with homefries. 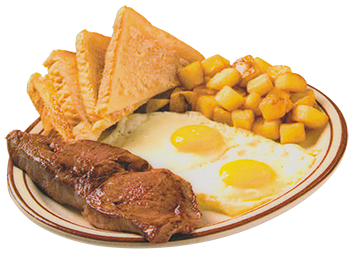 "More Than Enough" tender marinated beef or chicken, two eggs, homefries, toast & jelly. A grand portion of spicy Gyro meat, two eggs, homefries, toast & jelly. Two poached eggs atop an English muffin with Canadian Bacon and Hollandaise sauce. 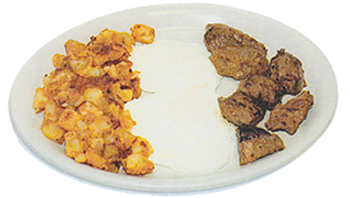 A hearty serving of beef and chicken, eggs, homefries, toast & Jelly. Cinnamon, banana, blueberry, strawberry or chocolate chip. Two eggs, choice of ham, bacon, Gym or sausage & Feta Cheese. Served with homefries, toast & jelly. Two eggs, two Sahlen's hot dogs, onion, Feta cheese & homefries topped with crumbled Feta. Served with toast & jelly. 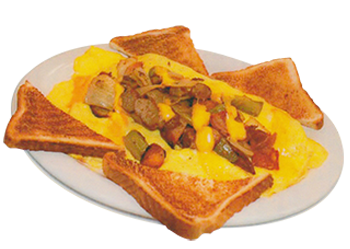 Three eggs, peppers, onions, homefries, and Feta cheese with your choice of ham, bacon, Gyro or sausage. Served with toast & jelly. Three eggs, two Sahlen's hot dogs, homefries, onions and American cheese, topped with crumbled Feta. Served with toast & jelly. Three eggs, with homefries, American Cheese, Peppers, Onions, Sausage and Bacon. Served with toast & jelly. Made with three slices of American cheese, Provolone or Swiss. Loaded with mushrooms, tomatoes, peppers & onions. Filled with turkey, tomato, bacon & Provolone cheese. English muffin, sourdough, raisin, italian or hard roll.